A few years ago a friend of mine gave me a Creme Brulee kit, I finally opened the box and decided to this dessert. Unfortunately I could not get the torch to work so I put it back in the stove under broiler to carmelize the sugar. As I mentioned before I’m not much of a baker but it looked easy enough. I already had a recipe from Ina Garten’s cookbook, Barefoot in Paris. 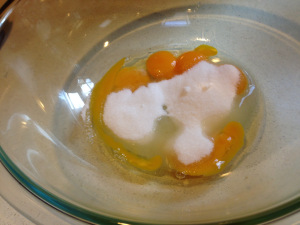 In a bowl of an electric mixer fitted with paddle attachment, mix the egg, egg yolks and sugar together on low speed.